The instrument has an arched foot, in which a gunner's sight and level is fixed. Hinged at the top of the sighting upright is an assembly of sundial, compass and plummet. The decoratively engraved arched foot has a small hinged silvered plate at each extremity; when folded underneath the foot these elevate the instrument slightly. On the underside of the foot is the signature 'VDALRICVS KLIEPER AVGVST FACIEBAT ANNO LXXVIII', lettered in red. The upper side of the foot has a slot with a scale against one edge to indicate displacement from its midpoint. The scale is 24 units long, divided to 2 and 1 and numbered from 10 to  to 10 by 2. The transverse line marking the midpoint of the scale is continued round the whole body of the foot. On one side of the foot it is labelled with an A which separates the terms 'KRECHEN' and 'LINGEN'. These archaic German forms are presumably explained by the equivalent Latin terms 'DEXTRA' and 'SINISTRA' on the upper face of the foot. On the underside of the foot the midpoint line cuts across the signature as a groove, which may have been used for sighting. The rest of the instrument sits in the slot and can be adjusted for position and fixed at any point by two screws. The sighting upright consists of two rectangular plates which would once have had a sliding sight in the slot between them. 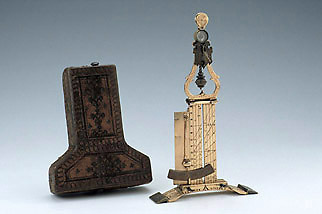 The vertical position of the missing sight would have been read against a scale of inches; the scale is 23/4 inches long, and the inches are divided to 1/4. Rather than numbers, each division is represented by a letter of the alphabet; the scale therefore runs from A to M.
Of the four faces of the upright, three are occupied with a continuous graphical scale. The scale is not labeled and its exact function is unclear but it would have been used in conjunction with the sight. There are equally spaced vertical lines numbered from 5 to 65 (perhaps representing weight of the gun), and these are cut by sloping lines numbered 3 to 12 (the 10 line is dotted and marked D). The bands between these sloping lines are alternately mirror gilt. The upright also carries a gunner's table distributed over the remaining face and one side of a hinged leaf attached to the upright. The table is outlined and lettered in red and provides information such as the weight of shot and powder for different types of gun: 'CARTHAV', 'SINGERIN', 'SCHLANG', 'FALCHONE', 'FALCKNET' and 'MORSER'. For the instrument to serve as a level, there is a plummet and arc scale, both of which are mounted on the blank side of the hinged leaf with the artillery table. The arc is titled 'WERFLAITER ZVN BELER' and its non-linear scale runs 130 to 0 to 180, divided to 60 and 10 and numbered as 120, 600, A, 600, 120, 180. The scale is presumably intended to give a direct reading of firing range for a given elevation; it swivels to the vertical for compactness in storage and folds into place on a rest in use. Since it is hinged, the plummet could have been used for levelling even when the instrument was mounted transversely on a gun barrel. At the top of the upright is an empty pair of hinges for a now missing plate. There is also a further hinged assembly which includes a plummet, a compass and a horizontal sundial. The grouping is probably largely decorative; certainly the compass and plummet cannot be used in the same orientation and there is insufficient friction in the hinges to retain a horizontal position. The compass is 11 mm in diameter and has an engraved cover, while the sundial has a folding gnomon and a silvered dial plate divided and numbered in red from 5 to 12 to 7 (10 is X). The instrument is accompanied by its original wood and pasteboard case. The case is in two halves, held together by two hook clasps. It is lined with red leather and covered with tooled leather. See J. Bennett and S. Johnston, The Geometry of War, 1500-1750 (Oxford, 1996), p. 35.